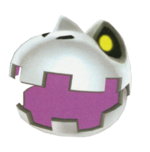 Mattermouths are enemies that first appear in the game Super Mario Galaxy 2. They resemble the skulls of Dry Bones as well as Bone Dragons. Its name appears to be a pun on "motormouth," and references dark matter. Mattermouths in Super Mario Galaxy 2. In Super Mario Galaxy 2, Mattermouths are found in places such as the Haunty Halls Galaxy and Bowser's Lava Lair and eat away part of the ground, which regenerates after a few seconds. If Mario falls into the holes in the ground created by the Mattermouths, he will lose a life. Mario cannot destroy them, but he can stop them temporarily by stomping on their heads, which will turn them around and cause them to begin eating the ground in the opposite direction. If Mario is attacked by one of these enemies, he will lose one wedge of his Health Meter. Mattermouths as seen in Mario Party: Island Tour. Mattermouths reappear in Mario Party: Island Tour in the minigame Tragic Carpet Ride. Here they eat up the carpet that the players are standing on while the players try not to fall. Gatsugatsu An onomatopoeia of rapid eating or gobbling. This page was last edited on February 28, 2019, at 00:48.